No matter what you need a pencil sharpener for, you won’t be disappointed in the PowerMe Electric Pencil Sharpener, a quick and powerful product that delivers better results and includes all the safety features you could ask for. This top-rated pencil sharpener runs on AA batteries and can sharpen a dull pencil in just three seconds flat. It has a specially engineered spiral drill that won’t jam up and can sharpen thousands of pencils without getting dull. Plus, there’s an auto-stop function that prevents the sharpener from working if the lid is open, and you’ll always be able to see when the transparent reservoir needs to be emptied. The manufacturer even offers a 100 percent money-back guarantee if you’re not happy with the product. According to reviewers, the PowerMe Electric Pencil Sharpener is lightweight, compact, durable, and easy to use. Many love how quickly it sharpens pencils, and several note that even young children can use it with no problem. On the hunt for an inexpensive pencil sharpener? The STAEDTLER Pencil Sharpener may be compact and simple, but it has thousands of positive review from students, artists, teachers, and more. This little 2-inch manual pencil sharpener includes a metal blade attached to a screw-on container. Just stick your pencil in the top and twist, and before you know it, your pencil will be as good as new! You won't have to worry about the shavings spilling out if the product is in your pencil case or backpack thanks to the screw-on top. The design may be simple, but people say it does a “crazy good” job and is worth every penny. Electric pencil sharpeners make quick work of even the dullest pencils, creating sharp points with little effort on your part. If you prefer the quick, hands-off performance of electric pencil sharpeners, you’ll love the heavy-duty JARLINK Electric Pencil Sharpener. You can power this pencil sharpener with AA batteries or by plugging it into an AC outlet. It has a helical blade that delivers a sharp pencil in just five to ten seconds, and it has an auto-stop feature that lets you know when the pencil is as sharp as can be. Plus, it also has a safety feature that prevents it from turning on when the lid is open, protecting the fingers of curious kids. Reviewers say you can’t go wrong with this electric pencil sharpener, which can stand up to regular use without losing steam! Plus, many love that you can switch between battery and AC power. If you're looking to purchase more supplies for your office or classroom, check out our round-up of the best notebooks. Years ago, this type of manual pencil sharpener was a staple in every classroom. If you prefer a good, old-fashioned crank sharpener, you’ll love the nostalgia of the X-ACTO Ranger 1031 Wall Mount Manual Pencil Sharpener. You can mount this manual sharpener on the wall, desk, or table, and it features dual helical cutters that get your writing implements nice and sharp. The all-metal construction can stand up to a high volume of use, making it perfect for a classroom or office, and it can even accommodate eight different pencil sizes! The X-ACTO Ranger Pencil Sharpener is designed to be sturdy and low-maintenance, and reviewers say it’s a great option for anyone who’s tired of electric pencil sharpeners pooping out on them. If you’re buying a pencil sharpener for a classroom, it needs to be rugged! After all, it will likely be used dozens of times per day and may very well take a few tumbles throughout its life. For this reason, there’s no better option than the X-ACTO School Pro Classroom Electric Pencil Sharpener, which has thousands of rave reviews from happy teachers. This heavy-duty electric pencil sharpener plugs into an electrical outlet, saving you from having to change the batteries every week, and it can be adjusted to fit six different pencil sizes. It includes a system that automatically stops when a pencil is sharp, and the blade life is supposed to be more than 30 times longer than that of standard sharpeners. Reviewers love the reasonable price of this product, and many say that it performs effortlessly, even with you’re sharpening a high volume of tools. Want to say “thank you” to your child’s teacher? Here are some suggestions for the best gifts for teachers. Just like regular pencils, colored pencils need to be sharpened from time to time, and one of your best options is the Prismacolor Premier Pencil Sharpener, which is made by a trusted art brand specifically for colored pencils. While compact and simple, this model still gets top marks from reviewers, many of whom are artists. The manual sharpener is specifically designed to work with prism color pencils, and it includes two separate blades—one that sharpens to a fine point and the other that achieves a medium point. Half of the sharpener’s body is translucent, so it’s easy to see when it’s full, and the compact 3-inch body will easily fit into any bag or pencil case. Reviewers love that it doesn’t eat up their pencils but still leaves their colored pencils super sharp without breaking the point. Rounding out your collection of art supplies? See our reviews of the most popular art easels you can buy today. Crayons may be a favorite among your kids, but they can also be used as wax resist on pottery, to tint embroidery and more. However, they won’t do you any good if they’re dull—which is why there’s the Elmer's CrayonPro Electric Sharpener. This electric crayon sharpener automatically peels the paper and restores crayons back to their original shape. It works on all standard crayons and features a heavy-duty motor that can easily cut through the waxy surface. It comes with a replacement blade cartridge, as well as a cleaning tool to remove wax buildup. 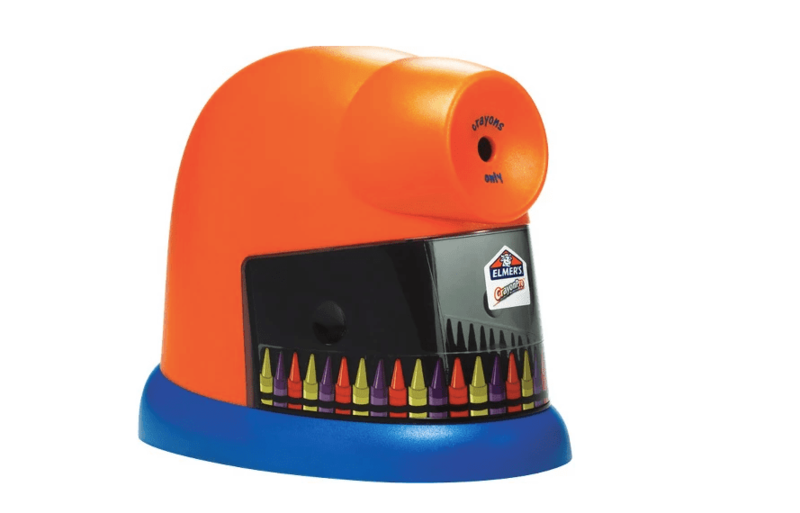 Basically, this crayon sharpener is a must-have for any playroom or die-hard crafter. If you’re an artist who works with regular pencils, colored pencils, charcoal pencils, or maybe all three, you’re going to need a reliable, versatile pencil sharpener like the OfficeGoods Electric & Battery Operated Pencil Sharpener. This product can be powered three ways—AA batteries, AC adapter, or USB cord—giving you the flexibility to draw anywhere, whether you’re working from home, the park, or a studio. This pencil sharpener has a stainless steel helical blade, and you can choose from blunt, medium, or sharp settings, depending on what you’re working on. It can sharpen up a pencil is around 10 seconds, and it has safety features that prevent it from operating while the cover is open, so you can feel safe with your kids using it. There are numerous artists in the comments who say it works perfectly on both charcoal and pastel pencils, getting them nice and sharp without breaking the points.